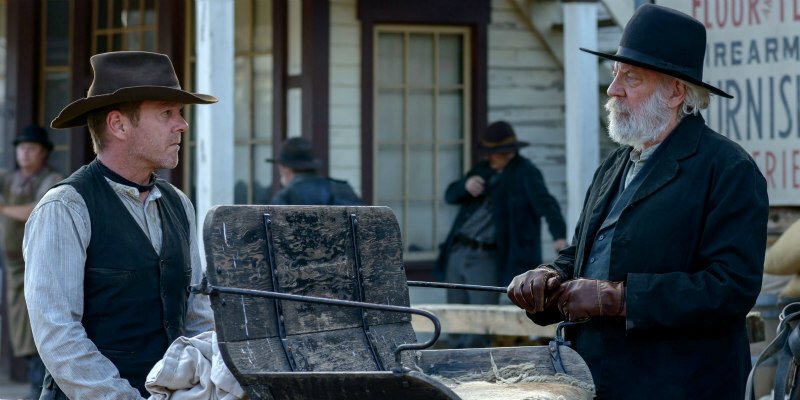 Forsaken, the brooding western starring real life father and son Donald and Kiefer Sutherland, has got us thinking about other Hollywood father/ son talents. Set in the rural town of Fowler, Wyoming in 1872, Emmy Award-winning Director Jon Cassar’s brooding western Forsaken tells the tale of pacifist Reverend Clayton, and his rebellious gunfighter son, John Henry. After retiring as a gunfighter, John Henry returns home with the hope of repairing his relationship with his estranged father only to find his hometown in imminent danger. A ruthless businessman is terrorising ranchers who refuse to sell their land to make way for a new railroad. Torn between a desire to make amends with his father, and fight for the freedom of his hometown, John Henry finds himself in the familiar predicament that first drove him away years earlier. Available on digital download from 4th July and Blu-ray and DVD from 11th July, Forsaken, starring real life father and son Donald and Kiefer Sutherland, has got us thinking about other Hollywood father/ son talents. Here’s a look some of Hollywood’s finest actors, and the sons that continue to uphold their legacies. With over 50 years of film and television roles under his belt, at age 80, Donald continues to impress us with his work on earlier films such as Klute and M.A.S.H., to his acclaimed roles in Invasion of the Body Snatchers and TV mini-series Path to War, to more recent roles in box office hits such as The Italian Job, Pride and Prejudice and The Hunger Games Trilogy. While this father / son duo worked together on A Time To Kill, their characters never interacted and so Forsaken marks the first film in which the pair actually share the screen. Donald has four sons, and each is named for a different director that he has worked with over the course of his career. Kiefer is named after Warren Kiefer, director of the first film Donald ever acted in, Il castello dei morti vivi (Castle of the Living Dead). Like his father, Kiefer has enjoyed success in film and TV. Arguably his most memorable role to date, Kiefer’s performance as Jack Bauer across 24’s eight seasons earned the actor six Golden Globe nominations, with one win. The actor also made a reported $40 million on the series over three seasons, making him one of the highest grossing television stars of all time. Other notable work from the younger Sutherland includes: A Few Good Men, Stand by Me, and The Lost Boys. At the ripe old age of 99, few can top Kirk Douglas’ track record in Hollywood. Not only did he star in classics including Spartacus, The Bad and the Beautiful, Lust for Life, and Champion, he is also one of the actors responsible for helping to end the Hollywood Blacklist in 1960. Having starred in a stage adaptation of Ken Kesey’s One Flew Over the Cuckoo’s Nest on Broadway in 1963, the actor fell in love with the work and purchased the rights to the film, eventually handing the project to his son, Michael. Kirk Douglas is a tough act to follow. Yet somehow, the Hollywood legend’s oldest son, Michael, rose to the challenge. After his breakout role in the TV Special The Experiment, the actor went on to produce his father’s dream project, One Flew Over the Cuckoo’s Nest. The older Douglas had hoped to play the leading role, but after some discussion, father and son agreed Jack Nicholson was more age appropriate for the role. Michael won an Academy Award for Best Picture as producer of the movie, cementing the burgeoning star’s celebrity status. Michael’s work in front of the camera includes his Academy Award winning performance as Gordon Gekko in Wall Street, Golden Globe award-winning performance in HBO’s Behind The Candelabra, and starring roles in acclaimed films such as Traffic, Wonder Boys, Fatal Attraction and many more. Both Kirk and Michael Douglas are recipients of the prestigious Cecil B. DeMille Golden Globe Award for Lifetime Achievement (1968, 2004). Best known for his performance as President Josiah “Jed” Bartlet in acclaimed political drama The West Wing and roles in Francis Ford Coppola’s Apocalypse Now and Martin Scorsese’s The Departed, Martin Sheen has four children, all of whom are also actors - including Emilio Estevez and Charlie Sheen. Martin has collaborated with his sons on numerous projects including The Way, directed by Emilio, and several guest star roles on television series with Charlie. Though he has famously struggled with substance abuse and mental health challenges, Charlie Sheen has contributed an impressive body of work to Hollywood. The star first started making Super 8 films with older brother Emilio and classmates Rob Lowe and Sean Penn at Santa Monica High School in the '70s. After high school, Charlie launched straight into acting, eventually garnering roles in hits such as Platoon and The Rookie, where he starred opposite Clint Eastwood. Iconic roles in '90s comedies such as Major League, Money Talks and Hot Shots! proved the actor’s gift for comedy, and in the 2000s Charlie moved over to work on television sitcoms. Charlie won his first Emmy for his role in Spin City, and eventually took on a role in Two and a Half Men for which he was nominated for three Emmy awards and two Golden Globe awards. In 2010, Charlie became the highest paid actor on television, earning $1.8 million per episode on Two and a Half Men. An officer of the Order of the British Empire for his significant contribution to the field of the Arts in Britain, English actor Timothy Spall got his big start on the hit ITV comedy-drama series Auf Wiedersehen, Pet. Following his rise to fame on the small screen, Spall received a Best Actor BAFTA nomination for his performance in the 1996 British dramatic film Secrets and Lies. Other significant work includes The King’s Speech, Sweeney Todd, the Harry Potter series and The Last Samurai. Timothy has three sons. While his father has made a brilliant career of playing primarily character roles and supporting leads, Rafe is a true leading male. Rafe’s acting chops are a clear indication he is his father’s son. Significant work includes Edgar Wright’s Grindhouse segment, Ang Lee’s Life of Pi, and most recently the film adaptation of Michael Lewis’ 2010 book The Big Short, based on the 2008 housing crisis in the U.S. Though at 33, the young actor already has an impressive resume, Rafe is on the rise, and is definitely one to look out for. Rafe is named after the lead character in the play Knight of the Burning Pestle. Both father and son have now played this role in their careers.